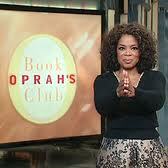 Oprah Book club was a JOKE and that is my final answer. i attended the taping of the last show. it was good. oh, i must enter your giveaway, it is still going on, hey, go to my blog and see what i've listed. Sidne, do tell! I have yet to watch the finale. Everyone says it was good. Yes, please enter the giveaway and on my way to your blog now.